Welcome to Week 2 of our Birthday Bash!! Sure, it is our birthday, but we’re giving the gifts to EIGHT lucky winners. We’re doing things a bit differently this time around. No weekly winners, but we’ll draw eight names when the giveaway closes March 18 and announce all the winners on Sunday, March 22. We’re doing only ONE Rafflecopter for the whole five weeks this time instead of one a week, and you can enter as often as you like. Scroll to the bottom to enter. Plus, as always, every comment counts from now until then as well. Got it? The winner of Deb Kastner’s giveaway of The Cowboy’s Forever Family (from her Feb 6 post) is LeAnne Bristow! The winner of Belle Calhoune’s giveaway of Patricia John’s novel, The Rancher’s City Girl from Feb 16 is Sally Shupe! Valerie Comer: My husband and I met in high school! We attended the same boarding school in Alberta, Canada—a school with strict social regulations. Skip the snuggling in corners. Not only was there not to be hand holding, but not even private conversations in a public place. When we first met, we lived hundreds of miles apart, but both our families moved and landed up 90 miles apart. This made post-high-school romance much easier, and we were married 3 years later. No regrets! He is the light of my life. Monday: Belle Calhoune shared a heroine to remember and offered a giveaway of Patricia John’s novel, The Rancher’s City Girl. Tuesday: Lee Tobin McClain tipped hats off to single moms! Wednesday: Krista Phillips shared how she spent Valentine’s Day with her true love. Friday: Hallee Bridgeman talked about love languages in real life AND fiction! Saturday: Lindi Peterson shared if you love romance, this post may be for you! Like Free E-Books and Deals? Keep an eye on our News Page to find new releases, awards, sales, and yes, free inspy romance novels! To any of the authors! What drew you to be a writer? Wow, that’s kind of a long story that started with a boring job with empty hours, for me! But I’m a total addict now. I can’t see ever stopping! What a sweet romance, Valerie! 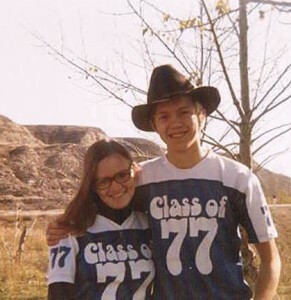 Great high school sweetheart story that ended up as your happily-ever after! Enjoyed your love story Valerie & may God bless you with many more years together! 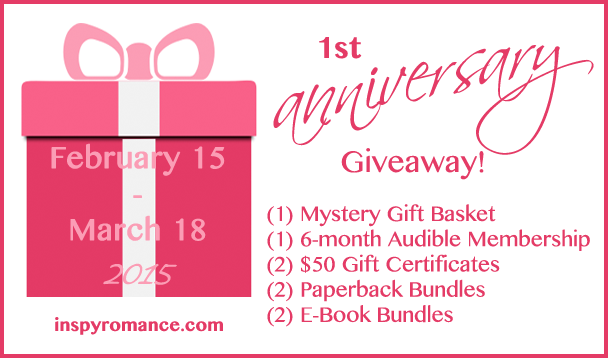 Happy 1st birthday Inspy Romance, I love entering for all these great prizes! And as always, enjoy reading the blog of the day & all of you wonderful authors. Congrats to the winners of the books, hope you enjoy them!